Honestly, a 30-minute meditation session felt like some sort of torture for someone with a mind like mine. However, it was only a very short time before I started being able to sit longer and being more comfortable when I did. I wasn't really into it at first. Meditation was hard. It required sitting and quieting my mind, neither of which I was very good at when I first got sober. Honestly, a 30-minute meditation session felt like some sort of torture for someone with a mind like mine. However, it was only a very short time before I started being able to sit longer and being more comfortable when I did. Now, I have begun to learn that there are more benefits to meditation than we were aware of. Goyal and his colleagues found that so-called "mindfulness meditation" -- a form of Buddhist self-awareness designed to focus precise, nonjudgmental attention to the moment at hand -- also showed promise in alleviating some pain symptoms as well as stress. The findings held even as the researchers controlled for the possibility of the placebo effect, in which subjects in a study feel better even if they receive no active treatment because they perceive they are getting help for what ails them. Clinicians should be aware that meditation programs can result in small to moderate reductions of multiple negative dimensions of psychological stress. Thus, clinicians should be prepared to talk with their patients about the role that a meditation program could have in addressing psychological stress. Stronger study designs are needed to determine the effects of meditation programs in improving the positive dimensions of mental health and stress-related behavior. A study in the Journal of Alternative and Complementary Medicine reported significant improvement of depression symptoms among those who meditate regularly. They also found that secular, nonreligious meditation practices showed results across the research population. This is a significant finding as depression affects approximately 350 million people around the globe and is a leading cause of disability. Depression is also a common co-occurring disorder among addicts, so it is not surprising that meditation has been part of addiction treatment since the publication of the Big Book of Alcoholics Anonymous, in which meditation has a prominent place in the 11th step. 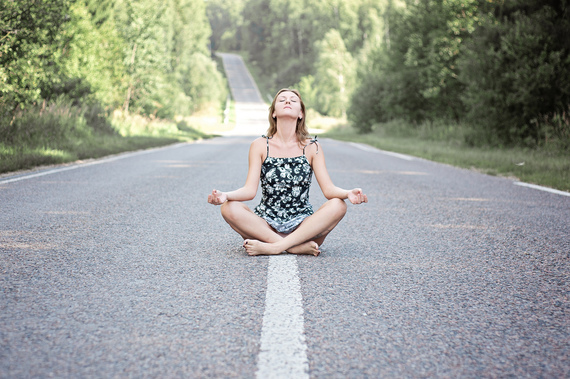 "Although the practice of meditation is associated with a sense of peacefulness and physical relaxation, practitioners have long claimed that meditation also provides cognitive and psychological benefits that persist throughout the day," said the study's senior author, Sara Lazar, PhD, of the MGH Psychiatric Neuroimaging Research Program. There is no doubt at all that a regular meditation practice can improve health in a number of ways, but the caveat is that the practice must be regular. Intermittent practice does not have the benefits of a habit. Daily practice can give you the greatest benefits. Start out small and do your best. You'll find that before too long, you will have no trouble at all with your meditation and will grow to enjoy the quiet.